What is now known as the Knowles House bed and breakfast is a classic old Bahamian settler's house exemplifying the sturdy, honest architecture of the island's early pioneer settlers. Built in the 1860s, when Key West was still a young settlement, the Knowles House is typical of the modest middle-class homes built by the intrepid Bahamians. These settlers left their native islands for the greater economic opportunities available in what was, at the time, the boomtown of the Caribbean. Employing the traditional architectural styles familiar to them from their native Bahamas, these enterprising pioneers utilized the abundant wood available in Florida to build the familiar frame "Conch" houses now ubiquitous in Key West, but largely unknown in the rest of the world. The Knowles House, with its wooden walls, ceilings and floors, is a classic example. This Key West guest house, as it now stands, illustrates the evolution of a family homestead over time as generations of the Knowles family and subsequent owners modified and enlarged it to accommodate changing needs and fashions. Originally built as a two-room-plus-loft cottage, the Knowles House existed for its first 70 years as a one-story cottage with a pitched roof. The low-ceilinged main floor contained the family living room, a narrow stair hall and the master bedroom. The eat-in kitchen and rear porch, where much of the life of the home took place, were contained in a one-story rear addition called a "saw tooth". This is where the present kitchen is located. The narrow staircase leads to the second floor where the children’s sleeping areas were located under the sloping roof. In 1935, the house was drastically altered by its owner, Rupert Knowles, to bring it more up to date architecturally and to provide more room for his family. He had the entire home raised to a full two stories under a low hip roof. Retaining the exterior of the first floor, including the windows, in its original form, he squared off the second floor, extending it out over the original front porch and over the rear kitchen saw tooth to create new space for four bedrooms and a full bath. The present fully-glazed front door was also installed to replace the original solid wooden one. At the same time, on the interior, the original wall separating the parlor from the stair hall was removed and replaced with the present wide archway, giving the main floor a more open and airy look. A new kitchen was installed in place of the old one, and the original open rear porch was enclosed to form a family dining room with lots of casement windows that could be opened to allow in plenty of light and fresh air. Electricity and modern plumbing were installed. One of the most important innovations was the construction of a large concrete cistern under the new dining room to provide the family with an abundant supply of water in the days before the present aqueduct was built to bring water to perennially water-starved Key West from the mainland. After the inn passed out of the Knowles family in the mid-1980s, subsequent owners remodeled the kitchen to its present appearance and added the rear porch. The rear yard, which had contained a vegetable garden, fruit trees and a frame garage for the Knowles family car, was completely reconfigured to accommodate a swimming pool and ornamental landscaping. In 1997, the current owners enlarged Knowles House by adding a wing to the rear, completing the evolution of this pioneer homestead to its present role as a historical bed and breakfast, while preserving its original character. From Eleuthera to Key West Florida. The branch of the Knowles family of Key West emigrated from the island of Eleuthera in the Bahamas, where it is believed that they engaged in farming and, possibly, fishing. 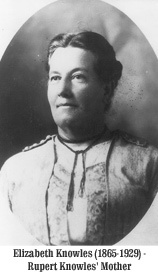 Family tradition maintains that the Knowles' had previously lived in the American colonies in the 18th century, but remained loyal to Britain during the American Revolution and were forced to relocate to the Bahamas, where they received land grants from the British government as compensation for their loyalty to the crown, when their lands in America were confiscated. As the agricultural economy of the Bahamas declined in the early 19th century, many Bahamians sought new opportunities in other parts of the Caribbean. Key West was an attractive destination because of the island's lucrative maritime trade, fishing and sponging and growing cigar manufacturing industry. This promise of a better way of life persuaded some members the Knowles family to leave Rock Sound and move to Key West where they knew they could comfortably fit into the established community of other transplanted Bahamians living in Key West at the time. The early Knowles worked in fishing, sponging and the cigar industry. By the later nineteenth century, David Knowles and his family were residing at Knowles House. David appears to have been primarily a sponge fisherman, and his house looked out across the open water that lapped up to the opposite side of Eaton Street. In the later 1880s, the shallows across the road were filled, and the present row of Victorian houses was built in the 1890s, depriving the Knowles family of its water view. 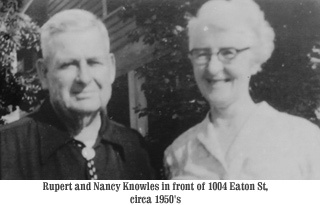 David and his wife Rosa raised their seven children in Knowles House. In 1909 David died leaving his widow alone to raise their younger children in the family homestead. For many years Rosa lived here with her youngest child, Benjamin Rupert Knowles, who had been born in the house in 1896. 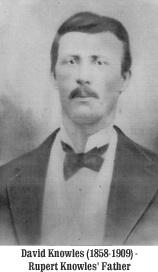 Known as Rupert, this son engaged in a wholesale business dealing in tropical fruit. In 1928 he met and married a young Swiss girl, Rosalie Weisser, known as Nancy. She was working as a nanny for a wealthy Miami family at the time they met at the Casa Marina Hotel in Key West. After their marriage, they continued living at Knowles House, looking after Rupert's aging mother, until her death in 1929. 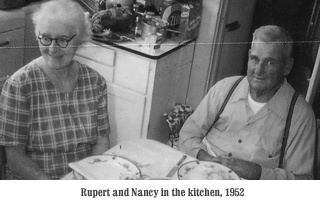 Rupert and Nancy had 3 children, Gene, Elizabeth Rose and Joan, all of whom were born in the house. 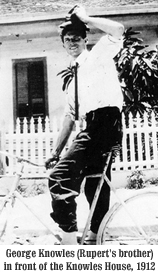 During the Great Depression, Rupert's tropical fruit business failed and the family experienced hard times as economic conditions in Key West worsened. Just when things looked bleakest, Rupert won the equivalent of $10,000 in the Cuban National Lottery in 1935. This economic boon enabled him to start a restaurant on Caroline Street near the bustling seaport. He also used some of the money to enlarge the family homestead, which had seen little change since its construction. The result transformed Knowles House to its present appearance and provided much needed space for his children. Although 1935 brought good fortune to Rupert's family, it also brought calamity to the Florida Keys in the form of the disastrous Labor Day Hurricane of 1935. Although thousands of people died in the middle and upper keys, Key West was spared the worst of the storm, only experiencing torrential rains. Unfortunately, the storm coincided with the renovation of Knowles House at a time when the roof had been torn off to add the second story. The children remember their mother Nancy sweeping the rain water out the front door as it cascaded like a water fall down the stairs. In spite of this setback, the remodeling of the house was successfully completed and the family enjoyed many happy years in the old homestead. As Rupert and Nancy's children grew up and married, they all left Key West, settling in other parts of the country. Rupert died in 1961. 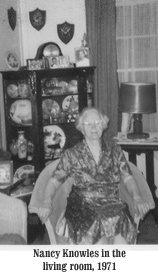 Nancy Knowles lived on in the family house alone until her death in 1983. After their mother's death, the children sold the house out of the family. After several intervening owners, each of whom made improvements to the property, the present owners, Les Vollmert and Paul Masse bought it in December of 1996. 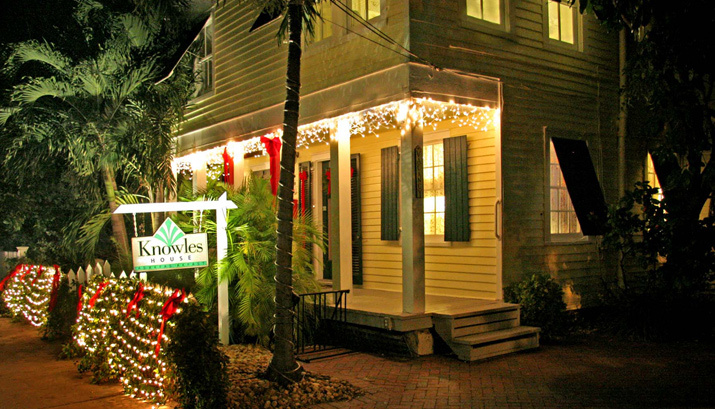 After further improvements and enlargements, they have continued to operate it as the Knowles House bed and breakfast Inn located in Key West Florida.